Villa Miami Vice Two Turks & Caicos. 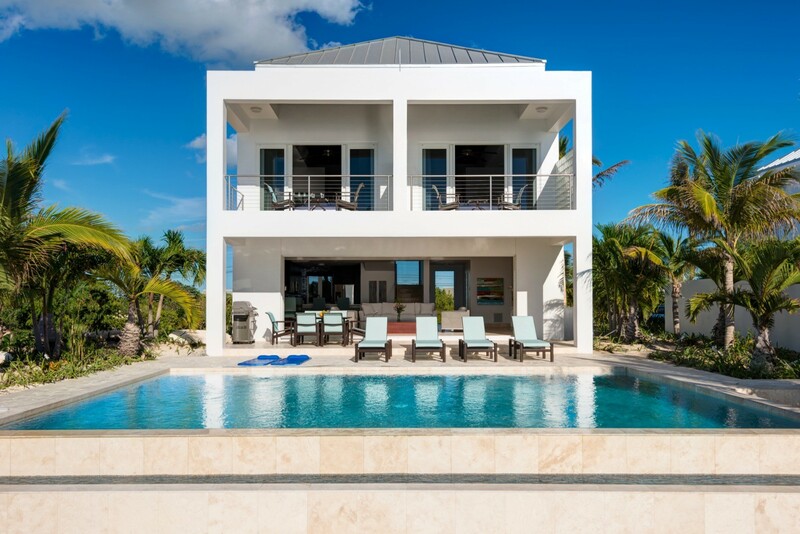 Set along Sapodilla Bay, offering gated access, and providing waterfront scenery in one of the most coveted locations in Turks & Caicos, Villa Miami Vice Two is the ideal place for a family or small group getaway. All-new, it has been designed to emphasize privacy and luxury, while placing you close to some of the most appealing locations imaginable. A two-story villa, this property features surrounding gardens and grounds that ensure your pool terrace remains private at all times, and yet your view of the sea is never inhibited. From the pool, gaze at your little beach below or the amazing sea waters beyond. You can also take in the scenery from the portico area that backs the sun deck. Here you will enjoy your meals "al fresco", and even use the barbecue to prepare fresh seafood. Just inside, and through the enormous arched entry, you can reach the beautifully designed lounge. Oversized sofas offer ample seating, and another small dining area. There is also the breakfast bar that leads into the open air kitchen. This is a truly gourmet space with all you would need to prepare even complex meals and snacks. Head up the marble stairs to the bedrooms, which both feature private balconies and oversized baths. The covered porticos feature more lounge furniture and a café table for each bedroom suite. Each has a freestanding tub in the center of the suite, allowing you to bathe in privacy while never missing a moment of the scenery or the sea breezes. Both baths have large marble shower stalls as well. The beds are king sized and placed for ideal stargazing, sunrise watching, and hours of lounging. The Villa Miami Vice Two is perfect for a set of couples to travel and enjoy together, or for a small family seeking the perfect tropical holiday. * Please note a cleaning fee of $285 is to be added to the rental rate. Bedrooms 1 & 2: Master bedrooms with a king-size bed, TV, private patio and en-suite bathroom with bathtub, shower, vanity and WC. 2 guests maximum per bedroom. Amazing Villa, the pictures really reflect the great views and the high quality of all the villa. A minor point to the owner of the villa. It would be great to add a ceiling fan in the gallery, a minor cost but with a huge positive impact. We are super satisfied with the overall experience. We had a great time there and all the service has been amazing since we arrive there. Pamela was great and answer a couple of questions (i.e. where to buy fresh fish!) and also when we had a minor problem with the BBQ, she solve it immediately. This villa exceeded our expectations! My Mom and I took a mother/daughter beach vaca in Dec. We spent a week in Provo we really wanted something off the beaten track yet still close to amenities. We were first welcomed by the villa manager who quickly showed us around the villa as I'm sure she could see the anxiousness to get in the water! First off, this villa has 2 bedrooms and 2 baths upstairs with separate private balconies hat BOTH face Sapodilla Bay! The huge walk in showers in both bathrooms have panoramic views of Chalk Sound. So absolutely beautiful. The downstairs features a large open kitchen, dining, and living room as well as a half bath. You can fully open the folding doors to make the outside private (yep, private) pool open to your living room. Just turn the TV to some nice island music and relax. Nice ocean breeze flows through both upstairs and down. We never even turned on the AC b/c at night it was just cool enough with the breeze (maybe different experience in the heat of summer!). We shared 2 paddleboards, 2 kayaks, and some pool floats with the smaller villa next door. You pretty much have the ocean all to yourself except for the occasional turtle and random kayaker. I paddleboarded to Sapodilla Bay Beach several times during our week stay which also had relatively little activity. The great thing about this villa is that it's safe (police station just down the road), it's in a quiet and absolutely gorgeous location. Yet if you want the hustle and bustle of Grace Bay then you're only a 10-15 min drive away. I highly recommend this villa and we are already planning our next trip back! This condo is modern and stylish, with gorgeous views of the lovely blue water. We loved the layout and design of the condo and spent a lot of time just hanging out by the zero-edge pool and gazing at that stunning blue water. You can step out from the condo and kayak and paddle board in the shallow and clear water. Simply put, this condo is awesome!